As I began to think about writing this edition of Summer Scene, I was reminded that the philosopher, Seneca, said, “Every new beginning comes from some other beginning’s end.” I’m not real certain how to begin a summer newsletter when we never had a winter season this year. It only got real cold once in mid March, and that cold snap almost wiped out our early sweet corn. Our state bird, the gnat, never went dormant this past non-winter. Neither did the pine beetles and every other insect and worm known to man which is going to make the chemical salesmen very happy down here. This growing season should be an interesting experience, and experience is what you have left after everything else is gone, sometimes including your money. Well, let’s move on into the summer activities here. Due to the record setting warm and dry winter, we decided to do very minimal controlled woods burning this spring which means that we will be using our bush hogs and mowers a lot more this summer. Speaking of rain or the lack thereof, I’ve often wondered why sheep don’t shrink when it rains. However, the dry weather has really been a benefit to our trapping program. Too much rain washes the urine scent off of the traps, and Casey has been steadily depleting our population of non-paying hunting guests. Casey lives by the rule that says never let something that threatens you get within twenty feet of you. A big old bobcat taught him that last season. Jerry is continuing his program of spraying Garton in the woods to control our briars and undesirable hardwood species. I wish we had a spray that could control the proliferation of politicians. I absolutely believe that we could really slow down the aging process if it had to work its way through Congress! While Jerry and his guys are trying to control undesirable plant species, Greg and his conservation crew are busily planting feed patches while battling the Texas Sugar Cane Aphid, a pest that only reared its ugly head about three years ago. I like both Texas and Texans, but y’all could have kept your expletive deleted aphid. This bug has really increased the costs of growing our food plots. Based on the statistics I looked at last year, I can only assume that many of our hunting guests are “vegetarians” which is an ancient Indian word for a poor hunter. So, if you can’t kill many quail, at least buy a lot of sweet corn between now and July 4th. 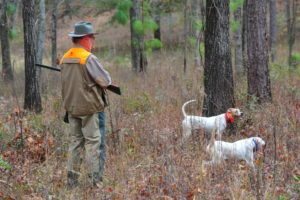 The late cold weather also wiped out the mayhaw and blueberry crops down here, but Retha must have been a girl scout because she had enough of each on hand to get us through this hunting season. Of course, we are now facing record heat, the mid 90’s, for this time of the year. I sure wish old Al Gore would make up his mind which way he wants to drive our climate. There are two things that I really want to emphasize in this year’s newsletter. First of all, Cader IV and his wife, Heather, completely redesigned our web site. They had professionals to work with, but we now have a brand new web site that is a real knock out. If you ever have any friends who want to know more about Riverview, please refer them to our web site, which is www.riverviewplantation.com. I have been accused of coming into the 20th century after we were already in the 21st century; so it’s safe to say this would never have taken place during the twilight of my mediocre career. The other real game changer has been our continued allocation of human and capital resources to our English Cocker breeding, housing, and training program. I KNOW that these little dogs have made our hunting safer. 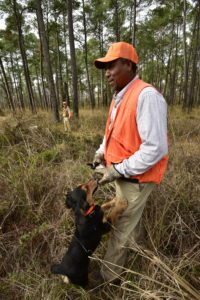 I also know that our average kill count is down a little while our average lost killed quail is WAY down. We now believe that we have enough Cockers on hand and in the pipeline that we can begin selling some to our guests who have been asking to purchase one of these lovable little critters for the past few years. We intend to sell puppies, started dogs, and completely finished Cockers beginning this season. Before I get into my favorite “random, rambling closing comments,” let me say that we will continue our very popular family holiday promotion dates. On the following dates this season we will discount our base rate by 35% to encourage family hunts. Of course, these prices also attract some groups who prefer to be called “frugal hunters” rather than tightwads. As has been my custom for years, I like to close Summer Scene with a few observations on life in general which may or may not have a thing to do with quail hunting, and the very first thought that came to my mind is “when is old enough to know better” supposed to kick in for me. I’m either going to live a long, long time or I’m a very late bloomer! I sometimes feel like I’m sliding down the Bannister of Life with the splinters pointed the wrong way. I really don’t understand how I can remember every word to a song from l 966, but I can’t remember where I left the TV remote fifteen minutes ago. I have learned that arguing with a woman is like reading the Software License Agreement. In the end you just ignore everything, and click “I agree” because you ain’t going to win! As many of you know, my beloved wife of almost forty-seven years now has been battling ovarian cancer since mid September. God has been so merciful and great, and so many of you have lifted her up in prayer. It makes me feel so good to say that Martha is finished with all of the hard part, and her hair is beginning to grow back. When she first started losing her hair, I told her that I thought hair was highly over rated to begin with. We both learned during this trial that next to prayer, laughter is the best medicine, and it’s a heck of a lot cheaper than most of our other medicines; so laugh whenever possible! I always like to close Summer Scene by thanking each of you for both your business and friendship. I wish each of you a great spring and summer while encouraging you to plan a trip or two to Riverview during the 2017-2018 hunting season. Let me close with this quote from a Joel M. Vance who said “Far better to have gone than never to have gone at all -for when the burden of years, the chains of infirmity become too heavy, it is too late to retrace the long road to yesterday.” We want to visit and laugh wit y’all again this season; so don’t put off a hunting trip to Riverview.